Email your questions about insect identification and pest management technologies and techniques to Dr. Mampe at dentomol@aol.com. Your questions most likely will be printed and answered in one of Pest Management Professional’s upcoming Ask the Expert columns. Q: I’m ordering new uniforms for my service techs. Do they have to wear long-sleeved shirts during the hot summer months? If that is necessary, can they wear short-sleeved shirts and then put on a windbreaker when necessary? Do they need gloves when spraying? A: The legal requirements for protective gear are on the label. Check the labels of the products you use and find out what is required. A windbreaker over a short-sleeved shirt should meet the label requirements if a long-sleeved shirt is required. You can also purchase “pull-on” sleeves, which will cover the area from the wrist to the bottom of a short-sleeved shirt. Gloves are required usually when mixing concentrates, and sometimes when applying the product. The label also dictates what sort of respiratory protection is required, if any. Q: A technician applied several ounces of a diluted insecticide in a basement by mistake. This product had an odor. The homeowner has commented that it smells. How do I handle this problem? The product is for outdoor use only. A: I would do everything to keep the homeowner happy, because this would be considered a misapplication by regulators. Scrubbing the treated surface with a bleach solution will help deactivate the active ingredient, but probably won’t eliminate the odor. Lots of ventilation is needed to solve the odor problem. If ventilation alone doesn’t do the trick, apply a two-part epoxy to the treated surface. Q: I was told by a colleague that I don’t need to dust carpenter bee holes. I’ve been doing this for years, which generally means lots of ladder work. 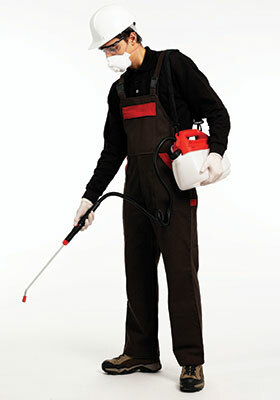 He just sprays the area with a residual and doesn’t worry about getting insecticide into the holes. Does this work? It would sure save me lots of time. AIt works. If you can get an insecticide behind fascia boards and shingles, so that the bees will contact the surface when they come and go from the nest, you will get control. In the past, others have dusted the holes, run a wire into the hole to kill larvae and then plugged the holes. In my experience, you get the same results by applying a residual around the area of activity. Regardless of the method, though, bees will likely return to the area next season. Q: I have “digger bees” working in a 2-ft.-wide section of lawn along a school sidewalk. Using a pesticide becomes a big deal because of integrated pest management (IPM) policy notification requirements. Can I do anything without using pesticides? A: Digger bees won’t go through thick turf, so I suggest laying sod on the affected area. Keep it well fertilized to prevent such digging by these ground-nesting bees in the future.